She stood, immersed in trauma, waiting for an answer. Her young son clung to her leg, visibly overwhelmed and scared. She carried only a small bag of food. Her son held nothing other than his mother's trembling hand. Their eyes told stories that most of us would look away from. Their tears held years of violence. Their bodies shook with anxiety and their shoulders hunched with a sadness of those who had been treated poorly most of their days. After a four-month journey from their home country of Guatemala, in what must have felt like a lifetime, they had traversed to the apex of the Sante Fe Bridge. The bridge joins Juarez, Mexico with El Paso, Texas. Two armed border control agents stopped them at that apex, demanding papers. If papers could not be produced, they were to head back into Juarez, where they would spend another night on the street. Another night. After so many nights. It was divine providence that our group spotted her. One of the leaders of the team from Hope for the Border, our host organization, had a keen eye and immediately asked who among us had legal training. 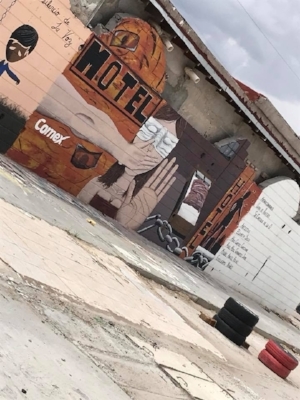 As we came to stand alongside her, this group of faith leaders who had traveled to El Paso for to learn, hold public witness and demand justice for migrants, we were unsure of exactly what to do. What we learned next would crush us emotionally and empower us spiritually. She was 4 months pregnant, as a result of sexual violence by a family member. Pregnant. A young, unwed woman. A woman who was fleeing violence at the hands of the powerful. A woman whose road looked so different from mine, but so similar to the one who carried our Savior. Our work on the top of that bridge turned from support to advocacy within a breath. She was seeking asylum, fleeing the terror of her life. The United States border control agents responded with "sorry, we've met our quota. We are full. There is no room for you." As we prayed with them and asked for a supervisor to speak with, time moved on. A supervisor appeared, with an attitude that was not forgiving. Three more officers joined, demanding that we all proceed down the bridge and leave this woman to reenter Juarez. Two spokespersons emerged from our group – Rev. Jacqui Lewis and Camilo Perez-Bustillo. With the wind of the Holy Spirit behind them, they spoke with the officers and firmly, but lovingly, demanded that the mother and son be allowed to enter Customs and Immigration and petition for asylum. This misfit group of collared clergy folk and justice advocates were not going to let them stay on the street for one more night. Asylum is considered for women who are pregnant, so with much frustration, the border control officials finally agreed to allow them to descend the bridge and enter the Customs and Border Protection building. We showered the family with love and some cash, knowing that their future was still perilous. Three options were possible: 1) she was turned around immediately and sent back to Mexico; 2) she was detained, likely having her son separated from her or 3) she was put into a process to grant asylum whereby she would be transferred to a shelter to await a court hearing. Our hearts broke as they walked away. As they looked at us, one more time, with eyes so big and full of uncertainty. If we are people of Jesus how does this NOT break our hearts? People often say to me, "Anna, when did you become such an activist?" My answer is simple: the day that I started holding the stories of others and allowing those stories to shatter my heart. I can't imagine the ways in which Jesus' heart broke on a daily basis, but I can imagine a fraction of the pain. Our call to hold both public and prophetic witness in the face of heartbreak is the work that Jesus has called us into. If we are a people who take seriously the words of Matthew 25:29-46, then we can no longer do our work solely from a pulpit or keyboard. We must find ways to engage in the work of prophetic faith in public and sometimes uncomfortable ways. I'm convinced that the work of the Church is nowhere close to finished. And I'm convinced that the words of Jesus have told us exactly how we are to be engaged in that work. But above all, I'm grateful for the witness of others, both those who have preceded us and those who stand alongside us in these spaces. Go now, let us ALL be about the work of Jesus.